Animals have evolved a suite of responses to help them cope with challenges. One of the most important is the stress response. When fish encounter stressors, they increase their production of the stress hormone, cortisol. Cortisol has widespread effects on the body, however, one of the main effects is increasing glucose levels in the blood. Over short periods, this response provides the energy necessary to deal with challenges, but long-term activation of this response is harmful, as it reduces energy stores and increases susceptibility to illnesses. Thus, it is important to be able to identify individuals, or even populations, which are particularly susceptible to stress to limit these negative effects. 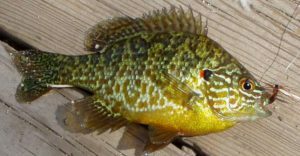 Pumpkinseed sunfish are found across North America, and are popular with novice anglers given their abundance (Figure 1). They are typically found in the littoral zone (near the shoreline), where they feed on hard-bodied prey; however, some pumpkinseeds can be found feeding on zooplankton in the limnetic zone (open-water; Figure 2). These environments are quite different, which would suggest that both the behaviour and physiology of the animals in these environments would differ. Fish living close to the shore are generally surrounded by many plants, and live in groups. Alternatively, pumpkinseeds living in the open water are typically solitary, and spend the majority of their time away from the substrate. Animals occupying these open-water environments are thought to be bolder, which is often associated with a reduced stress response. However, it is unclear whether this reduced response to stress is an effect of the physical environment, the social environment, or a combination of these factors. A team of researchers led by Cassia Belanger, out of Carleton University, set out to investigate this further. Pumpkinseed from either open-water or near the shoreline were caught using line-and-hook on Lake Opinicon (Figure 3), near Kingston, Ontario. Blood samples were taken when fish were captured to measure baseline cortisol levels, following which fish were exposed to air for three minutes. A second blood sample was collected 45 minutes later to assess their stress response. During the time between samplings, fish were placed under different environmental conditions. To assess the the effect of environmental complexity, fish were provided either no substrate or cobble substrate with 0%, 50%, or 90% vegetative coverage. To investigate the effects of the social environment, fish were placed with either one, five, or no other pumpkinseeds. Cortisol and glucose levels were measured in the blood samples to assess levels of stress. Neither environmental complexity nor the social environment that fish were placed in during the experiment had an effect on maximal cortisol or glucose levels. However, pumpkinseeds caught near the shoreline had higher levels of both cortisol and glucose following the air stressor than those caught in the open waters. Baseline levels of cortisol and glucose were unaffected by location. 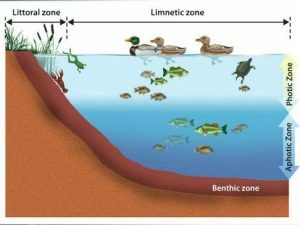 This suggests that animals from the more “risky” open-water environment are less sensitive to stress than those living in the “safer” waters near the shore, as they mounted a reduced stress response. However, this reduction does not appear to be a result of either the social environment or the environmental complexity, as neither had any effect on cortisol or glucose. This reduced responsiveness may therefore be a result of an interaction between the two factors, or due to genetic differences between the populations. The environment with which an animal resides can have drastic effects on the way that it copes with challenges. This is especially important to consider as the rate of human disturbance toward aquatic habitats rises. It is essential to determine which populations are most susceptible to these disturbances and protect them accordingly. Belanger, C.B., Peiman, K.S., Vera-Chang, M.N., Moon, T.W., and Cooke, S.J. 2017. Pumpkinseed sunfish (Lepomis gibbosus) from littoral and limnetic habitats differ in stress responsiveness independent of environmental complexity and presence of conspecifics. Canadian Journal of Zoology. 95: 193-202.